Chop onions and brown in soy sauce. Add beans, salt, and paprika, stirring often. Cover with boiling water and cook in pressure cooker on medium for ten minutes. Add vegetables and more salt, herbs, tomato paste, and tomato puree. Add water until about 1 inch above the ingredients. Pressure cook for a further ten to fifteen minutes. Cover cashew nuts or sunflower seeds with one cup water and blend until very smooth. If necessary, thicken the stew with corn flour and add the cashew and the food yeast. Let simmer for one minute. 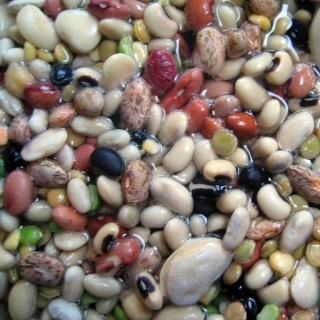 Without a pressure cooker, the beans can be precooked until almost done, then added to other ingredients and baked in a casserole dish for an hour.